The once invincible Roman Empire is teetering on the edge of collapse. Will the idea of humans turned savior-gods survive the end of empire? Will their claims of God’s approval echo in other realms and times? For the fourth-century inhabitants of Rome, the thought that their civilization would shortly collapse was remote—about as remote as the British would have thought the chances of their 19th-century empire dissolving within a few decades, following not one but two unprecedented world wars. Equally today, it seems almost unthinkable that the United States could no longer be the dominant power sometime in the near future. Yet the fact is that no empire or superpower in history has been able to resist its own demise. To the Romans, the end of empire seemed utterly impossible. As with each preceding imperial power, their dominant influence had spread like a stain over vast areas of the known world. Their architecture, their dress, their language, their currency, their military prowess, their adopted form of Christianity—and above all, their government—was everywhere. They had become civilization. But for the few with eyes to see, the signs of internal decay were already present decades earlier. The fall of the Western Roman Empire is traditionally dated at 476 C.E., when the so-called barbarians sacked Rome. But it was really with the death of the Christian emperor Theodosius the Great in 395 that the collapse slowly began. He was in fact the last emperor to rule over a united Roman Empire before the West’s demise. As John Julius Norwich notes, “from the moment of his death the Western Empire embarks on its inexorable eighty-year decline, the prey of the Germanic and other tribes that progressively tighten their grip” (Byzantium: The Early Centuries, 1988). During his rule, Theodosius had set in motion certain religious practices that would play out in the coming centuries. It was he, for example, who introduced the term Catholic Christian into Roman Christian religious life. Although Ignatius had first used the word catholic in 110 to describe Christendom as a whole, Theodosius now made a significant distinction: in 380, he issued an edict defining a Catholic Christian as one who believed in the consubstantiality of the Trinity according to the Nicene Creed. He further anathematized any who did not, referring to them as “mad and foolish” and ordering that they “bear the ignominious name of heretics . . . to be visited first by the divine vengeance, and secondly by the stroke of our own authority, which we have received in accordance with the will of heaven.” Here, as in Parts 1 and 2 of this series, we witness a ruler who uses conformity to humanly devised religious codes to subjugate some and to manipulate others in the name of God. But even the emperor’s authority had limits. In an event that proved to be a hinge of history, this Christian ruler was deemed to have gone too far. It came about in 390 when the people of Thessalonica, objecting to the billeting of Rome’s barbarian troops there, murdered a Gothic captain. An outraged Theodosius ordered the punishment of the city. Though he soon countermanded the order, his reversal came too late to prevent the death of seven thousand citizens in a bloodbath in the local hippodrome. The bishop of Milan, Ambrose—more powerful at this point than the bishop of Rome—refused the emperor communion until he publicly repented. In the first confrontation of its kind in the Christianized empire, a spiritual leader opposed a temporal one and won. Theodosius donned sackcloth and came to Ambrose for forgiveness. Norwich notes, “It was a turning-point in the history of Christendom . . . , the first time that a Christian prince had publicly submitted to judgement, condemnation and punishment by an authority which he recognized as higher than his own.” But it was not to be the last time as the temporal power of the religious hierarchy grew within the borders of the empire. The first of the barbarian tribes living within the empire to rise against Rome following Theodosius’s death were the Visigoths. They invaded Italy in 401 under their leader, Alaric—a man who had fought both for and against Rome in recent years. Though Alaric was not interested in overturning Roman society (his goal was to find a secure yet autonomous home within it for his people), he besieged the capital three times. When his patience with Rome’s refusal to agree to any terms ran out, the third siege ended with the sacking of the city in 410. But Alaric’s progress and that of his people soon ended with his death following a raging fever. Next came the Huns under their leader, Attila, “the Scourge of God.” In 452 he and his hordes swarmed over Italy, capturing many cities. During his advance toward Rome he suddenly stopped, saving the city from collapse, at least for a while. A year later Attila was dead from a hemorrhage and the Hunnish people were denied victory under their greatest leader. The Vandals were the third of the barbarian peoples to come against Rome. Settled in Spain in the early fifth century, in 429 they captured Rome’s North African possessions and cut a deal whereby they gained Senate recognition as legitimate members of the empire. Their king, Gaiseric, soon reneged on the agreement and declared an independent kingdom centered on Carthage. The Vandals’ moment came in 455 when the emperor Valentinian III died, and they set sail to attack Rome itself. Over a two-week period they plundered the city, removing its wealth to their North African capital, including vessels that had been taken from the temple in Jerusalem after its destruction in 70 C.E. Rome limped on for another 20 years until Orestes, commander of the army in the West, rose in opposition against the new emperor, Julius Nepos. Establishing himself as kingmaker, Orestes promoted his own son as emperor. The barbarian mercenaries, on whom the army had depended for many years, now pressed Orestes for more land of their own. When he refused, they put forward a member of a Germanic tribe, the Scyrian Odoacer, as the new Augustus. In the ensuing struggle, Orestes was put to flight and killed. In turn his son, Romulus Augustulus, was forced to abdicate. Thus it was that Odoacer and his men participated in the end of the empire in the West in September 476. Though Odoacer himself refused to name an emperor in the West (he saw himself as restoring the empire to one ruler, now resident in the East), his action meant that the Roman people soon became accustomed to having no local imperial authority. It was to be 60 years before a new leader, Justinian, would arise to conquer Italy once more in the name of Rome. In the meantime, the resulting power vacuum led to the rise of the important and long-lasting political power of the papacy. According to Norwich, “men looked for another father figure. . . . And so they raised up the Bishop of Rome, already the Primate of Christendom, investing him with temporal authority as well as spiritual and surrounding him with much of the pomp and semi-mystical ceremonial formerly reserved for the Emperors. The age of the medieval Papacy had begun.” Gradually the papacy took on the imperial Roman model as its form of government, adopting ancient Roman titles such as Pontifex Maximus, and new ones such as “Holy Father” and “Vicar of God and Vicar of Christ” (standing in place of God and Christ on earth). Not surprisingly, with the passage of time, the church’s leaders became influential players in world politics. Meanwhile, in the years following Odoacer’s removal of the emperor in the West, a ruler arose in the East whose peasant origins in Thrace seem to contradict the achievements of his reign: Justin was a military hero but also uneducated and illiterate. The reason for his success lies with his nephew and adopted son, Justinian, whom he allowed to guide the creation and execution of policy. Indeed, according to some accounts, Justinian may well have engineered his uncle’s rise to power. By the end of Justin’s reign, the pieces were in place for a return to the golden days of empire. His subjects were on the verge, in Norwich’s words, of “an age in which, under a once-more benevolent God represented by a noble and dazzling Emperor, it would regain its lost territories and recapture its past greatness.” In April 527, Justinian and his wife, Theodora, were named coemperor and empress. In August Justin died, leaving the couple to govern together for 21 years and Justinian alone for a further 17. During his rule, Justinian pursued the recodification of all Roman law, attempting to remove all contradictions and to bring it into harmony with Roman Christian teaching. In 529, after only 14 months, the new code was ready and became the final authority throughout the empire. The emperor’s religious policy was based on the unity of church and state and the belief that the empire was the physical equivalent of its heavenly counterpart. Justinian understood himself to be Christ’s vice-regent on earth and the defender of the orthodox faith. In this regard, he ran true to the self-image of previous emperors: he saw himself as a kind of religious savior. For this reason he moved to protect his Catholic subjects against their Arian Christian counterparts throughout the empire. Arians claimed that Christ was merely the highest of created beings and not of the same substance as God. As Justinian grew older, theological concerns increasingly dominated his attention. Among his legislative acts was the establishment of the nonbiblical festival of Christmas as a civic holiday, and fixing January 6 as the date of the Epiphany (celebrated by some as a commemoration of the Magi's visit to Jesus, and by others as the anniversary of His baptism). Whatever his other interests, Justinian devoted himself more to the lost lands of the empire in the West than to any other cause. He believed that it was his responsibility to regain Christendom’s domain. First came the recapture of Carthage from the Vandals. When Justinian’s victorious general, Belisarius, returned to Constantinople, he did so to a hero’s welcome, bringing with him the spoils of war, ranging from Vandal chiefs to the menorah, the seven-branched candlestick from the Jerusalem temple. Justinian, whose superstitious nature was aroused by warnings from the Jewish community, returned the candlestick and other temple vessels to Jerusalem lest bad fortune befall him. The recapture of Italy from the Ostrogoths proved a more difficult task, consuming most of the remainder of Justinian’s reign. Unlike North Africa, where Gaiseric had ruled independently, Italy was governed as an imperial territory under a viceroy. Eventually, after seemingly endless battles, sieges and counterattacks, Italy was united with Byzantium. On the other side of the Mediterranean, however, Justinian was less successful. Nonetheless, though he failed to conquer all of Spain, the emperor could say by the end of his rule that he had restored the empire from the Black Sea to the Atlantic. For all of his failings and failures, however, Justinian’s imperial like was seen neither in Byzantium nor elsewhere until more than 200 years later when another king arose, whose conquered territories would approximate the outlines of the old Western Empire. In the eighth century, the pope and his territories came under pressure from the Lombards. They had migrated into Italy from the north in the area of Noricum and Pannonia (roughly today’s Austria and part of Hungary) following the death of Justinian, putting an end to his revived Roman Empire. Trapped between Lombards on both sides and differing with them over doctrinal matters, Pope Stephen II sought security elsewhere. He turned to the Roman Christian Franks, who had become the most successful of the barbarian peoples as the empire failed in the West. Their territory under the Carolingian dynasty comprised much of modern France, Switzerland and western Germany when the pope crossed the Alps in 754 to seek help from Pippin III. The king agreed to protect the leader of Western Christendom, and in return the pope anointed Pippin, his wife and his sons to be the new royal family of Francia, and appointed Pippin patrician of the Romans. This gave the Carolingians enormous religious legitimacy and opened the door for them to establish themselves within Italy as the defenders of Roman Christianity. Following Pippin’s death in 768, his son Charlemagne greatly expanded Frankish territory. Believing in the power of the sword to extend and defend Christianity, he quickly concluded the war in Aquitaine, defeated the Lombards (774) and seized their crown, and made his son sub-king of Italy (781). There followed successful campaigns against the Saxons (concluded 797), whom he converted to Christianity; the annexation of already Christian Bavaria (788); and the subjection of the Avars (796) in the area east of Bavaria and today’s Austria. Soon the territory of the only Christian king in the West stretched from the North Sea to the Adriatic. This gave the papacy the opportunity to proselytize new lands in northern and central Europe. Charlemagne’s reputation was such that the patriarch of Jerusalem named him protector of the holy places and gave him the keys to the Holy Sepulcher. Charlemagne visited Rome for the first time at Easter in 774. Signaling his loyalty to Roman Christianity, the king climbed on his knees to meet the pope, kissing each step of the great staircase of the Basilica of St. Peter as he went. That same year, the Frankish king confirmed to Pope Adrian I Pippin’s gift of territories in central Italy, creating the Papal States. Charlemagne’s defeat of the Lombards at around the same time caused the pope to name him the new Constantine. 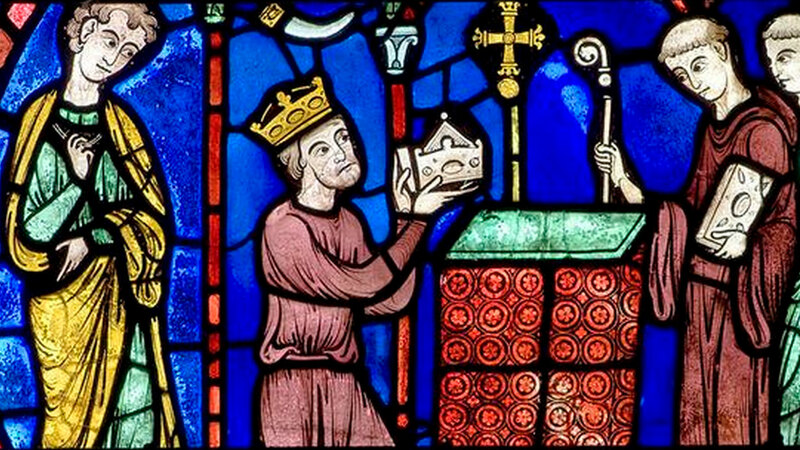 On Christmas day, 800, Charlemagne returned to the city. As he rose from celebrating mass in St. Peter’s, Pope Leo III placed the imperial crown on his head and consecrated him as emperor of the Romans. It seems that the moment may have been prearranged in the summer of 799 in Paderborn, Saxony. An insurrection in Rome, directed against the pope, had brought him to Charlemagne’s court to request help. As protector of Western Christendom, the king could not refuse. But the quid pro quo for the emperor’s willingness to help was of much greater significance than the defeat of the Roman rebels. Italian historian Alessandro Barbero notes that the people of Rome were to acclaim Charlemagne emperor, “just as in previous times they had acclaimed Augustus and Constantine. Thus the Frankish king would become the successor to the Roman emperors. . . .” In 800, the Western Roman Empire was thus reborn. According to professor of early medieval history Rosamond McKitterick, Charlemagne’s coronation was “an act that was to have far-reaching ideological repercussions in the succeeding centuries” (Atlas of the Medieval World, 2003). At least until the fall of the Papal States in 1870, if not beyond, “the Carolingian imperial ideal, with its connotations of Roman and Christian imperial rule in emulation of Constantine and Theodosius, played a powerful role in European political ideology,” writes McKitterick. Leo’s act was certainly something out of the ordinary. No pope had ever taken such power upon himself. He assumed the right to appoint the emperor of the Romans. The pope had risen above his protector. Aside from Leo’s role in his elevation, Charlemagne understood himself to be divinely appointed and responsible for the spread and support of the Roman Christian religion across the entirety of his empire. In monasteries, abbeys, churches and religious schools, the use of the Latin language was one of the evidences of continuity with the Roman past. Charlemagne’s efforts to organize ecclesiastical affairs, according to McKitterick, “proved an effective long-term means for cultural imperialism and the spread of Frankish influence and Latin Christianity.” In 794, the king even achieved a single European currency by reform of coinage—something modern Europeans have only recently begun to reinstitute. That Charlemagne saw himself in imperial terms even before his coronation in Rome is demonstrated by his palace at Aachen, mostly complete by 798 and designed to compete with Rome, Constantinople and Ravenna (the “second Rome” in the West). However he viewed his role, the emperor’s massacre of 4,500 unarmed, surrendered Saxons resulted in a black mark on his reputation. According to Barbero, Charlemagne saw himself as a biblical David fighting pagan enemies, so it is not difficult to imagine that he justified himself vis-à-vis the Old Testament, “from which the king drew constant inspiration.” But as with other rulers who cruelly enforced the prevailing nonbiblical orthodoxy, Charlemagne’s fierce reactions to Saxon noncompliance went beyond the spirit and teaching of the New Testament. Barbero notes that “the most ferocious of all the laws enacted during his life, the Capitulare de partibus Saxonie, . . . imposed the death penalty on anyone who offended the Christian religion and its clergy.” In one specific example, those who did not fast on Friday were to be put to death. He was, as his spiritual advisor Alcuin put it, “a chief whose devotion never ceases to fortify the Catholic faith with evangelical firmness against the followers of heresy.”. So far in this series, we have seen that association with religious belief and/or practice on the part of rulers may reveal little more than expedience. Men in supreme power have exploited all religions and their adherents, from Roman paganism to Roman Christianity. Moreover, they have imagined that the mantle of savior-god has fallen on their shoulders, much to the detriment of those who did not accept their self-appointed divine status as arbiters of orthodoxy. J.B. Bury, History of the Later Roman Empire From the Death of Theodosius I to the Death of Justinian, vol. 2 (1923, 1958). J.B. Bury, The Invasion of Europe by the Barbarians (1928, 2000). Rosamond McKitterick, Atlas of the Medieval World (2003). Pierre Riché, Daily Life in the World of Charlemagne (1973, 1978).